Clergy Confidential: Ancient Text Discovered! BREAKING NEWS -- An ancient Biblical text was recently discovered in the Egyptian desert that debunks a controversial piece of Christian Scripture. 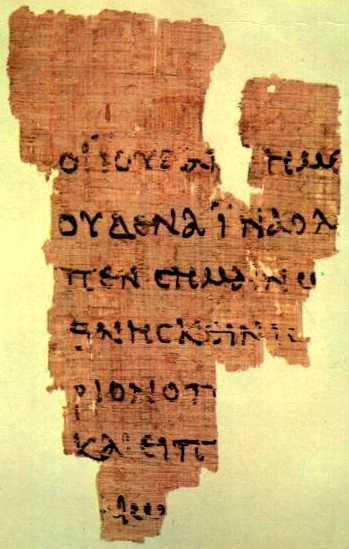 Scholars have been left scrambling how best to interpret a papyrus fragment containing a single verse -- John 20:19. Liturgical Christians traditionally read this passage on the Sunday after Easter at the start of the story of "Doubting Thomas" (John 20:19-31). The line "for fear of the Jews" has led to instances of anti-Semitic behavior perpetrated by Christians at various points in history. This, coupled with the Passion Narrative from John's gospel, has led some Christians to the conclusion that it was "the Jews" who crucified Jesus. Indeed it wasn't until the 1960's that the Roman Catholic Church officially repudiated this assertion. Then the same day at evening, being the first day of the week, when the doors were shut where the disciples were assembled for fear of the juice...(italics added for emphasis). In other words, the early church was not afraid of "the Jews" at all but of "the juice." Scholars are currently holed up at the Vatican attempting to determine whether the offending juice was orange, apple, or pineapple. One viewpoint has emerged arguing that it was not fear of juice per se but rather of co-mingling combinations such as cranberry-grape or mango-guava. 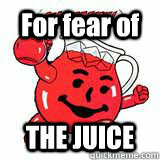 We also understand, from an anonymous source, that one prominent scholar is pushing a theory that the early Christians were not afraid of "the juice" at all but lived in dread of "the Juice" aka O.J. Simpson. Attempts to contact Jose Canseco for his opinion on whether this may involve Performance-Enhancing Drugs (aka "juice") have been unsuccessful. While we all await the final verdict, network television executives in America have, in an attempt to distance themselves from juice, banned advertising from Capri Sun, Tropicana, and Welch's. Complicating matters for liturgical leaders of denominations such as the Methodist Church is their use of grape juice at communion. When asked about their serving of juice during services, Methodist headquarters issued a blanket "no comment" statement. Stay tuned as this controversy continues to unfold. This is, of course, no laughing matter and as Christians we cannot simply ignore these inferences when they arise in our Scriptures. My assistant, the Rev. Anne Emry, has written a brief blurb we like to run in our bulletins on this Second Sunday of Easter (see below). Feel free to use or adapt it in your own congregation or if you use something similar, consider sharing it. Thanks and continued Easter blessings to all. Christianity has a difficult history which includes terrible persecution of Jewish people. It is important to clearly address how wrong it is, and how far from the teachings of Jesus. Know this: Jesus was a Jew and his followers were mostly Jews. The people he preached to, taught, and healed, were mostly Jews. He taught from the Jewish Scriptures and was executed by the Romans. Later historic struggles between Christian and Jewish communities, reflected in the Gospels, allowed anachronistic transfer of blame from the Romans to the Jews. Anti-Jewish violence and prejudice is intolerable. We must not force the Jews to lock their doors for fear of the Christians. Now I hope this isn't some ruse...but, maybe they actually were afraid of the Jews...they were also Jewish. But it doesn't matter since that was over 1,000 years ago. Life has evolved since then. We can't live in the past and expect the feelings of people we will never know to translate into modern life. Christians and Jews both suffered persecution. They still do in this day and age but at least we don't feed people to lions and tigers anymore. Life was different then.